Welcome to Exotix Capital's developing markets round-up newsletter, which is freely available and therefore not classified as research under MiFID II. In our first theme – ‘China and the Belt and Road Initiative – indivisible from geopolitics and the global trade war; threats and opportunities’ – Hasnain Malik, Head of Strategy and Equity Research, and Christopher Dielmann, Senior Economist, unpick some of the conventional understanding of the costs and benefits of China’s huge infrastructure development plan, identifying complexities that, they argue, many mainstream commentators miss. Our second theme – ‘When the tide goes out… Macro headwinds expose vulnerability across FM & EM equities’ – explores the difficult environment for FM & EM equities, driven in part by interest rate dynamics both in the developed world and in developing markets themselves. We explore this by looking at three main sectors: financials, industrials and consumers. For the frontier and small emerging markets (FM-EM), China was, historically, mainly a competitor supplier of cheap manufacturing exports or a customer of natural resources. More recently, China has become a major provider of capital, a supplier of construction services, an investor in real estate, a customer for tourism and an acquirer of corporate assets. Five years have passed since the formulation of, what is now referred to as, the Belt and Road Initiative (BRI); a catch-all term for what is best understood as Chinese capital investment and project construction capability in return for geopolitical alignment. Here, we put forward five initial conclusions and two risk factors on the general impact of China on FM-EM. We will look to refine these as 2019 unfolds. Does not differentiate between the most and least important geographies, from a China perspective, of BRI: the economic catch-up of China’s western provinces with the growth enjoyed by its eastern provinces, which is necessary for their sustainable inclusion in China’s centralist political model, requires the establishment of import and export logistics infrastructure, particularly through the Indian subcontinent (ie BRI investments in this geography are likely strategically a higher priority than others in the event of a cutback on overseas Chinese investment due to any domestic economic slowdown). To access the full report by Hasnain Malik & Christopher Dielmann, click here. Our growing network of research partners, both specialist local brokers and independent research providers, enables us to bring you wider coverage and an expanded knowledge base. 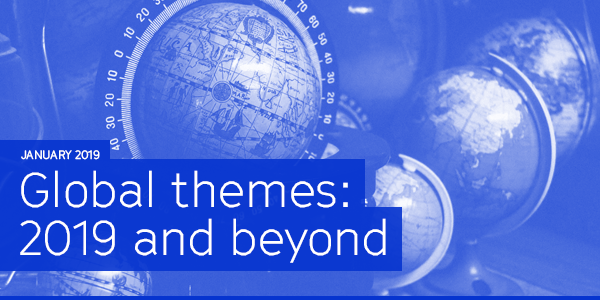 Uniquely, our sectoral lead analysts draw out the key trends and investment implications across this expanded universe of developing markets and distil them into actionable ideas. We bring this to bear in our second theme, which explores the rising vulnerability across FM & EM equities. In good times, weaknesses can be hidden. But, when the tide goes out, things look very different. Although EM headlines in 2018 were dominated by a wide variety of risk factors, including trade tensions, commodity prices and rising levels of debt, increasing US interest rates were a key driver of EM underperformance, exacerbating the impact of rising debt levels and rollover risks. US monetary policy normalisation drove up borrowing costs on USD-denominated liabilities and also led to relative appreciation of the US dollar, making dollar repayments even costlier. We expect the pace of US rate rises to slow in 2019, although monetary policy normalisation is expected to continue in many other developed markets. The combination of higher, albeit more slowly rising US rates, and monetary policy tightening elsewhere in the developed world in 2019 mean that excess indebtedness will remain a significant risk. In Financials, Rahul Shah assesses the potential winners and losers in 2019 from diverging interest rates in developing markets. 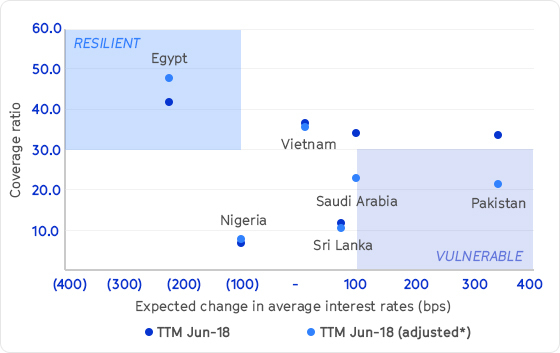 Banks in GCC and Pakistan look best placed to benefit from improved margins, while Egypt, Uganda and Ghana could see margins decline. In Industrials, Vahaj Ahmed has sliced and diced 108 companies across our coverage universe to create an Exotix Industrials Ranking, assessing the most resilient (and potentially the most rewarding) names over the next 12 months. Overall, he likes Egypt and Nigeria top down, but there is plenty more to digest. In Consumers, rising rates could have a severe impact on indebted companies. Nirgunan Tiruchelvam’s Teflon Test identifies those consumer names most at risk if the debt bomb explodes in 2019. View the detailed summary of this theme here. To access the full report by Rahul Shah, Vahaj Ahmed and Nirgunan Tiruchelvam - including stock recommendations - you'll need to become a subscriber. To find out more about our subscription options, email us today. Got a question for our team? Email our analysts today. Before joining Exotix Capital in 2017, Christopher spent four years working within the International Monetary Fund’s Debt Policy Division as lead analyst for all debt sustainability modelling, which underpinned all IMF lending programs and debt restructurings during this time, and served as lead instructor for the joint IMF/WB Debt Management Facility’s technical assistance training to over 40 central banks and debt management offices. In addition to his work at Exotix Capital, Christopher serves an advisor on debt and capital markets to the West African Institute for Financial and Economic Management (WAIFEM) and is a member of the Institute of International Finance’ (IIF) working group on the Voluntary Principles of Debt Transparency. Christopher holds BS & BA degrees from Syracuse University’s Maxwell School, a dual Masters in Economics and International Relations from the John Hopkins School of Advanced International Studies (SAIS), and is a CFA charter holder. He has held previous positions at Freddie Mac, Deloitte Financial Advisory Services, and the World Bank. Before joining Exotix in 2014, Hasnain founded Frontier Alpha, a boutique research firm, and was a managing director at Citi in MENA investment research for 14 years. Previously, he was in London covering European and global sectors at Barclays de Zoete Wedd. He was also the first analyst to publish equity research on a number of companies in the region from sectors such as conglomerates, consumer and real estate. Hasnain has served on the board of the Middle East Investor Relations Society since 2008. He read Philosophy, Politics and Economics at Oxford University and has an MPhil in Economics. Hasnain has been highly ranked by institutional investors since 1998, in sectors as diverse as utilities and technology in Europe. He was top ranked in MENA equity strategy in the 2012 Institutional Investor survey and his team took second place globally for Frontier Markets research in 2017. 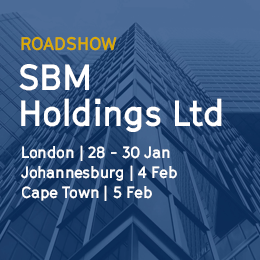 Senior representatives from SBM Holdings Ltd will be travelling to London, Johannesburg and Cape Town this January and February, and you're invited to meet them. Meeting slots are available for all locations - request yours today. 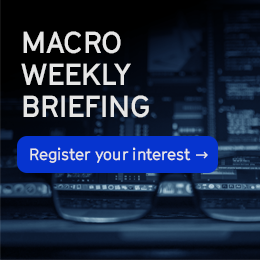 The Macro Weekly Briefing combines our expertise in economics, corporate and sovereign credit, equities and more into a weekly digest delivering need-to-know insights and actionable intelligence. Be the first to hear about this new service - register your interest today. “This development will dramatically deepen the scale of the property plays” on the Singapore exchange, Exotix Capital analyst Nirgunan Tiruchelvam said. “Interestingly, the regulations guiding the establishment of the payment service banks force the telcos and other PSBs to meet the same minimum documentation and data requirements for new customers as the banks,” says Olabisi Ayodeji, analyst at Exotix Capital. Fabrizio Ferrero, co-head of global investment banking at Exotix Capital, which advised Diamond, said the merged entity will be a leader in mobile banking. “If we could be sure [the IMF] deal was being done, Pakistan would be our key pick for 2019,” Hasnain Malik, Strategy & Head of Equity Research at Exotix said. 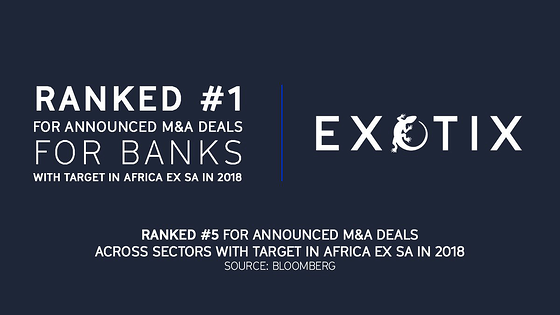 Last week, Exotix was ranked #1 for announced M&A deals for Banks with target in Africa ex SA in 2018, and ranked #5 for announced M&A deals across sectors with target in Africa ex SA in 2018 according to Bloomberg data. By receiving this e-mail and/or accessing the links provided herein you agree to be bound by the Exotix Terms & Conditions.